During the 2008 Beijing Olympic Games, several members of the U.S. Olympic team were stricken by a food-borne illness just days before they were to compete in their event. This happened despite the America’s precautions of shipping meat to their athletes in China. In the upcoming 2010 Winter Olympic Games in Vancouver, authorities are not taking any chances. Food served at the Vancouver and Whistler Athletes Villages during the game will be kept at precisely the recommended temperature with the help of a remote monitoring system pioneered for space use. The idea of “strategic control points” monitoring was first put to practical use by the National Aeronautics and Space Administration (NASA). The sensors report via radio signals every 15 minutes to tablet PC-sized handheld receiver units. Culled data is sent securely to a computer where the information can be analyzed at a glance to help uncover health standard violations, faulty equipment, or bad food handling practices. 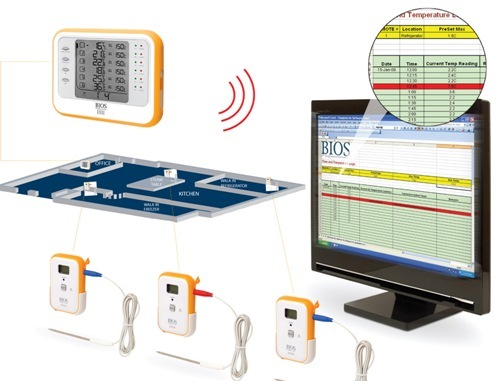 “The system has been jokingly referred to by many users as the kitchen nanny,” says Tim Osland, director of sales for food services for Thermor Ltd., the Newmarket, Ont-based firm that is supplying the BIOS Wireless HACCP Temperature Manager. “Essentially, the system keeps tabs of equipment and food service areas so personnel can go about their other essential duties rather than go through the tedious but important task of checking freezer or food tray temperatures,” Osland said. Hot and cold foods need to stay within a specific temperature. For example improperly stored foods could potentially be contaminated by salmonella , listeria, E. coli and other pathogens. To avoid such hazards, food must be stored or displayed at temperatures not more than 4 degrees C for cold items and not less than 60 degrees C for hot items. Olympic food service contractor Sodexo will monitor and maintain the data provided by Vancouver Coastal Health (VCH). VCH will employ 75 field officers, equipped with the WiFi-enabled electronic tablets, during the Games to provide 18-hour-a-day testing of food service facilities. Two intensive sweeps are planned, one for the week prior to the Games opening and another partway through. Traditionally, Osland said, temperature checking is carried out by a kitchen staff member who goes around with a thermometer and clipboard in hand at least twice a day. This conventional method has several drawbacks, according to Karen Foster, director of food services and environment at the Bridgepoint Hospital. 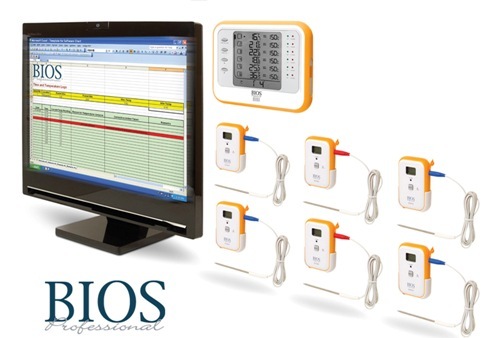 The 479-bed complex chronic care and rehab facility in Toronto installed The BIOS system in March last year. Foster said the traditional process ties up kitchen or food service personnel. For instance, Bridgepoint, which has a conventional “cook-served kitchen”, makes use of a lot of raw foods. The temperature checker would have to inspect temperatures in six walk-in refrigerators, the pass-through oven in the cafeteria and other food holding areas up to four times throughout the day. The original method is prone to human error and neglect. Although it has not happened at Bridgepoint, Foster said, the old system is also susceptible to “dry-labbing”. This occurs when personnel record numbers even when they never bothered to take temperature readings. “With the BIOS system, readings are time-stamped and recorded on a computer and can not be altered tampered with,” she said. Data collected by the receiver units from the sensors can be transferred to a computer. Users only need Excel spreadsheet software to be able to read and print the data. This enables users to keep track of their readings and also present a report to food inspection authorities when requested. Foster who keeps the hospital’s receiver unit at her desk says it also serves as a great monitor for equipment maintenance and kitchen best practices. The unit beeps when it senses that temperature in a certain equipment has dropped or risen above the set parameters. “When I hear it beep I know something is out of the normal,” she said. Personnel can then check to see what has caused the alarm. “It could be just a freezer door left open or it could be that the machine has failed. The important thing is that we get to check it before the food is affected,” Foster said.